The RS Aero UK Winter Series 2015/2016 encompassed 9 events from Christmas to Easter including many of the SailJuice Series and two South West Series events, covering the country from West Yorkshire to Devon. For this series, all RS Aeros were scored together on PY which allowed some flexibility to provide options for our variable winter weather. Whilst on the whole we had a windy winter it was also very mild allowing great fun racing without too much chill! 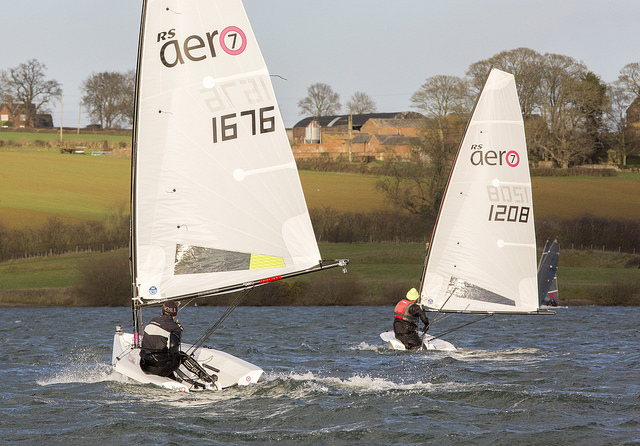 55 RS Aero competitors entered at least one event and the series included two main events, the Winter Championships at Oxford and the Spring Championships at Grafham. One of these two had to be counted in the series and both produced fleets of 20 plus. Several other events had RS Aero fleets of about 10, which was great in the depths of winter, often with adverse forecasts. Going into the final event the series was still wide open. Matt Thursfield (Chelmarsh) could take victory on tie break from Peter Barton (Lymington) if he won the Spring Champs and several sailors were vying for the last spot on the podium if they could replace their result at Oxford with a better one at Grafham. Ultimately it was Fergus Barnham (Snettisham) who took the Spring Champs leaving Barton the Series victor from Thursfield in 2nd. Andrew Snell’s (Datchet) 4th at Grafham elevated him to 3rd overall in the series. The accolade of both 1st Lady and 1st Youth went to Caitlin Atkin (Alton Water) who raced her 5 rig throughout the series. Outside the RS Aero Series the RS Aeros had some success overall too. Andrew Snell secured 20th out of 586 entries in the SailJuice Winter Series. Andrew had a great time touring that circuit, competing in 6 out of the 7 events, braving the cold and most often strong winds too! 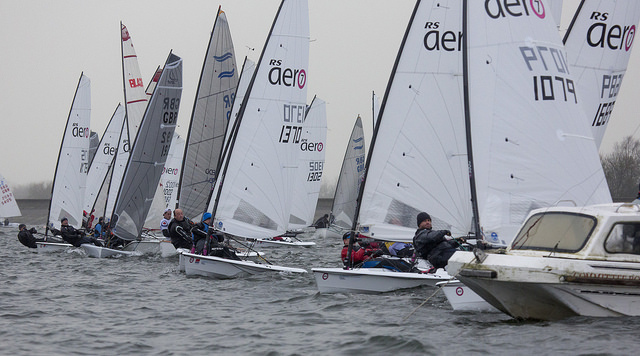 The RS Aeros collectively managed the 2nd highest SailJuice class turnout with 36 sailors entries recorded over the series and only the Lasers fielding more. Peter Barton won two of the South West Series events, the 100 entry Starcross Steamer and the Roadford Rocket in very contrasting conditions. Dan Bridger (Salcombe) was rewarded for his endurance with his 9 rig to take 5th overall in the ‘no discard’ South West Series. RS Aero 7s revelled in the blustery conditions at Oxford, Northampton and Rutland. 3 boats made the top 10 at Northampton’s competitive Steve Nicholson Trophy and just a month later, home boat, Anthony York recorded an incredible 23.9kn speed on his GPS at Northampton with his 7 rig! Many thanks to Magic Marine who sponsored the prizes for both the overall Winter Series and the Spring Champs.